Most of our tents sleep 2 people. Others sleep 4 and a few sleep up to 6. Tent sizes range from 12’ x' 14’ to 16’ x 20’. All sites have a fire pit and picnic table. Comfy beds, warm down comforters, wool blankets, and cotton linens guarantee sweet dreams. Every tent is situated on a wooden platform with leather butterfly chairs on the deck. 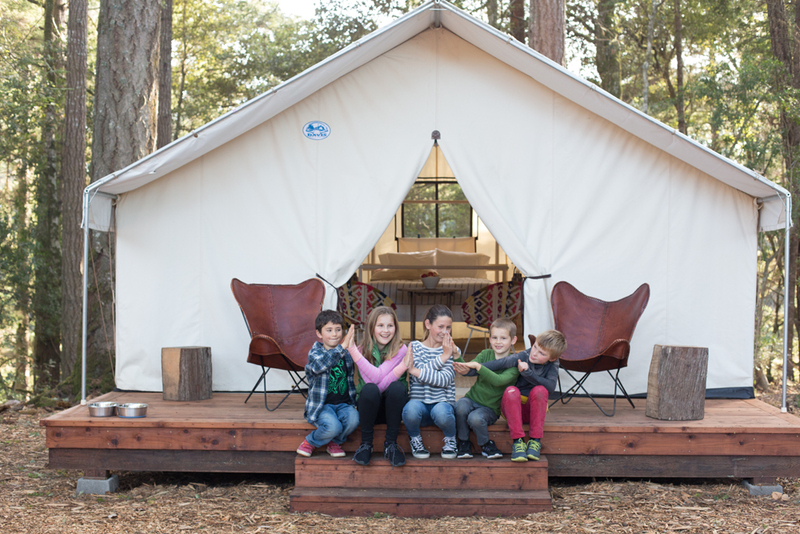 Encompassing 37 acres, our roomy Safari-style Classic and Family tents come fully-outfitted with heated beds, down comforters, crisp cotton linens, lanterns, and more. Each tent is housed on a wooden platform with a redwood deck complete with comfy leather butterfly-chairs & table... perfect for relaxing and taking in the grand firs forest and ocean air. All campsites include a picnic table and fire ring with grill ideal for cooking, intimate fireside storytelling, and warmth during the cool mornings and evenings. Wheelchair accessible tents are also available. Tents are located 30’- 70’ feet in proximity to another. 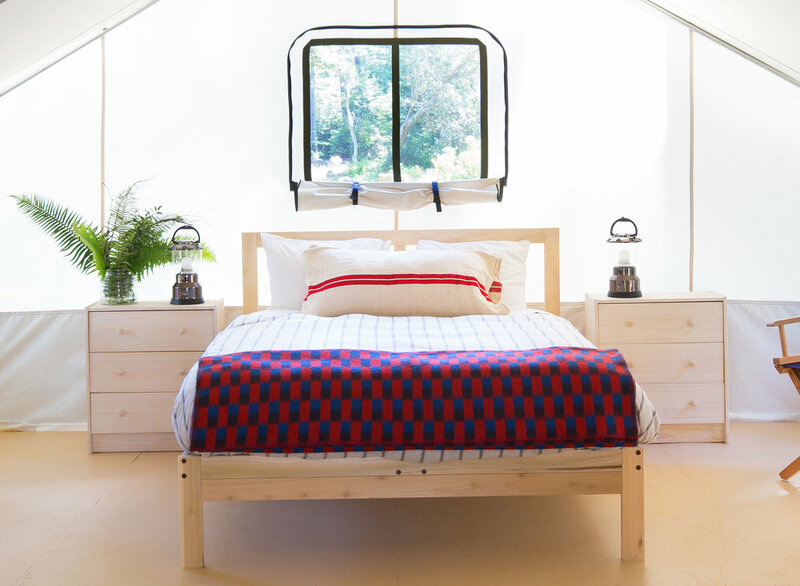 Our tents have limited electricity for powering the bedside lamps and heated mattress pads. To reduce the risk of power outages, we ask that you do not use the electrical outlets for any unapproved devices. Please call ahead with questions. CPAP machines are approved for use in all tents. How do I arrange for tents to be next to each other? Booking multiple tents in a reservation does not guarantee that tents will be assigned next to each other. To arrange for tents to be located next to each other please call our office. Our staff will do our best to accommodate reservation requests for guests wanting to be in close proximity, although we do not guarantee tent assignments or promise specific site numbers. Reservations of five or more tents are considered a group booking and must be booked as such in order to guarantee your tents will be assigned together. We have special areas on the campground designed for groups of 5 tents or more. These areas are designed with community gatherings in mind to allow for more privacy. Can I see a map? Because of on going property developments we do not publish our map. Our map and our tent assignments are subject to change at any time. We do not have designated tent assignments in advance of your reservation date. We cannot promise specific site numbers, although we can guarantee that you will be accommodated in the tent class you have booked and we will do our best to accommodate any request for a specific area. Guests who make a group reservation will be guaranteed their specific group site.